GrandVJ 2 comes with a new interface, making it even more user friendly and straightforward, while integrating new functionalities in it. Manipulate, trigger and mix video clips with sound, animated text strings or live cameras in much the same way as mixing music to create a spectacular audiovisual show. 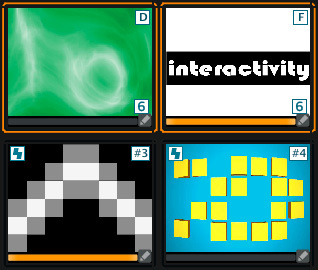 GrandVJ can mix up to 8 layers with a vast library of video effects, transitions and sound driven visual generators. The A/B crossfading mode with independent preview makes it incredibly flexible to perform live, and the Browser Preview feature lets you preview visuals, effects, transitions and sources before sending them to the output, just like a DJ previews his next track in his headphones. GrandVJ runs on both PC and Mac and accepts all common video and image formats. Its intuitive interface lets you turn your keyboard into a super controller for zipping through the functions. Need more? GrandVJ’s learn mode makes it a breeze to set up any MIDI controller and with support for the network based OSC protocol you can even control GrandVJ with an iPhone or an iPad. Hook it up and start the show! The ArKaosConnect plug-in allows GrandVJ to receive sound and MIDI from any audio sequencer compatible with VST plug-ins, running on the same machine or on another machine on the network. Incredibly easy to setup, the plug-in configures itself automatically! For VJs, ArKaosConnect enables a new level of interaction with Musicians. For Musicians, ArKaosConnect makes it fun and easy to add a video track to compositions during live performance. GrandVJ is very easy to customize to each user’s preferred setup. The interface can quickly be modified to fit individual needs and preferences. Mapping MIDI controllers with the new learn mode is easy as pressing keys on your device but you can also import predefined presets for the most common MIDI controllers. On top of all this, Mac OS X users can mix Quartz Compositions (.qtz files) as Sources with all their other visuals, but also as Effects, with GrandVJ automatically mapping the composition inputs as effects parameters.GrandVJ comes preloaded with a set of great Quartz Compositions from selected Artists, you can easily find tons of other .qtz files out there on the Web and of course you can use your own compositions created with Apple’s Quartz Composer, which makes visualization possibilities in GrandVJ practically endless..
GrandVJ is a real-time video mixer software allowing to compose up to 8 layers of Video on the fly. 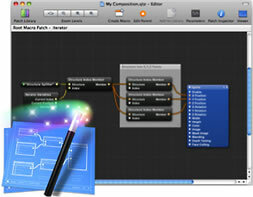 Take any video from your hard drive, add effects to it and start making your own video show. GrandVJ’s ultra powerful video mixing engine allows seamless mixing of SD and HD video with sound and a vast library of effects and generators. With its intuitive MIDI mapping system, you can remotely control all operation using keyboards and controllers. Manipulate, trigger and mix video clips with sound, animated text strings or live cameras in much the same way as mixing music to create a spectacular audiovisual show. 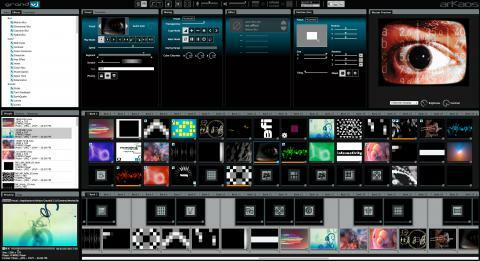 GrandVJ can mix up to 8 layers with a vast library of video effects and sound driven visual generators. The A/B crossfading mode with independent preview makes it incredibly flexible to perform live. GrandVJ runs on both PC and Mac and accepts all common video and image formats. Its intuitive interface lets you turn your keyboard into a super controller for zipping through the functions. Need more? GrandVJ’s learn mode makes it a breeze to set up any MIDI controller and with support for the network based OSC protocol you can even control GrandVJ with an iPhone. Hook it up and start the show! GrandVJ is very easy to customize to each user’s preferred setup. The interface can quickly be modified to fit individual needs and preferences. Mapping MIDI controllers with the new learn mode is easy as pressing keys on your device but you can also import predefined presets for the most common MIDI controllers. Cherry on the cake, GrandVJ allows bidirectional communication with controllers supporting generic MIDI feedback like Livid’s Block and the APC40 from Akai. This great feature allows the software to send information to the controller so that, for example, switching layers will reflect parameter changes to the unit and you can focus on your mix without the need to look at your monitor. 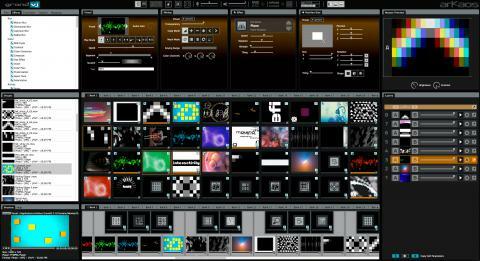 On the mixing side, GrandVJ comes with an updated ArKaos effects library and a long list of automated video generators. It will play and mix mostly any video file you throw at it – yes, including VOB, DIVX and MKV, with sound – GrandVJ also offers extensive support for various other media including most image formats; Flash text and animations; and multiple camera inputs that can be used as Sources and mixed live with Effects.